I believe this is a truly excellent article explaining expansionary monetary policies and outlining the possibilities of unwinding quantitative easing programs. Eighteen global leading economists share their opinions. 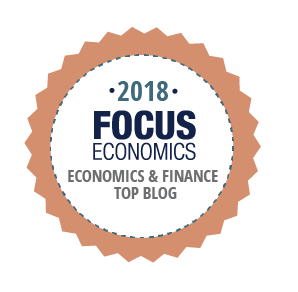 Please read all the comments at Focus Economics here. “The Federal Reserve is already seriously behind the curve. Reducing the balance sheet by $600bn after a $4.7 trillion stimulus and delaying rate hikes simply make the problem more difficult to solve as we approach a change of cycle and the central bank finds itself with fewer tools. The Federal Reserve should take advantage of the unprecedented demand for USD and the fact that macro drivers and corporate profits are improving to accelerate its unwinding of the stimulus. However, it seems comfortable ignoring the risks of perpetuating bubbles in financial assets. By being too focused on financial markets it becomes what I call in my book “Escape from the Central Bank Trap” a “pyromaniac firefighter” that creates a massive bubble and presents itself as the solution when it bursts. The Federal Reserve could be raising rates and unwinding its balance sheet by $50-100bn every month now that demand for bonds and equities remains solid and the employment, inflation and growth data is improving, while earnings estimates are increasing. There would be more than ample secondary market demand for a solid sterilization program.